The Windsport, ever changing, stock of boats and equipment for sale is ideal for anyone getting started, looking to update or change craft. For the latest stock update or to receive further information on a particular boat / item contact the Windsport Falmouth team direct via our CONTACT PAGE HERE. Sprint 15 – No Used Sprint 15s currently! in sound working order great boat for family and fun sailing. Serviced and ready to sail . – Windsport race spec . – In excellent race condition. Accessories to be included : Road trailer, launching trolley, boat is complete and ready to sail, with a spare spinnaker, tired but usable, and two spare jibs again tired but o.k. It has a full boat cover. This catamaran was purchased new in late 2013 and has the sail number 10027. It has been sailed gently and infrequently by a mature couple. Most of the sailing was done with a reduced area “pin top” or “school” mainsail consequently the original 11.5sqm mainsail has hardly been used and is in almost new condition. The twin trapeze equipment has never been used. It has never been raced and never capsized. Extras include the “pin top” sail, Launching trolley, Hull/Top cover (never used). There is a road trailer but as this is “home made” from an old caravan chassis, is not included in the sale but would be offered to the new owner as a free gift. Equipment included:- trampoline boat cover. Notes:- Exciting double trapeze boat to sail, all equipment in excellent working order. Little used over the last 5 years. Option of extra gennaker kit with if required. Great family fun catamaran from Hobie Cat ideal for blasting around the bay on the weekend or on holiday. Little used and in good serviceable condition with big wheel launching trolley, kick up rudder system, coloured sails. Road trailer options, new or used avaible on request. – Foil bags , hull covers , mast cover, GPS Pro Start, launching trolley, stern supports and fast graphics! 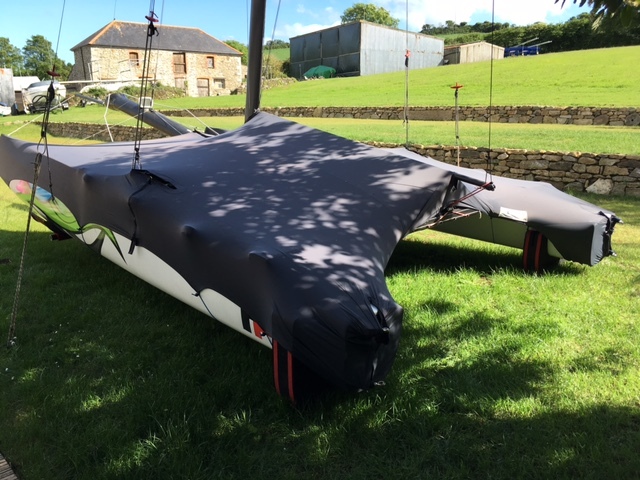 The Firebird catamaran fleet in and around Falmouth has one of the most popular one design racing fleets that race regularly in Flushing Evening Racing (Tuesdays) and Royal Cornwall Friday Night racing. There is a further Championship weekend every year usually in June with a regular fleet in Falmouth Week too. Selection of new and used road trailers / launching trolleys and other equipment available on request”.